During Toronto winters, salts and chemical deicers could cause efflorescence to develop on your masonry structures; here’s why and what to do about it. How Do Chemical Deicers Cause Efflorescence? At the base of all concrete products is cement, which naturally causes lime or water-soluble calcium oxide to be produced. Lime is also commonly found in bedding sand, soil or aggregate base materials. 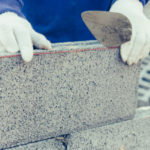 Concrete and brick pavers are durable but they contain a network of invisibly small veins that run through the interior, this is what allows water to enter masonry work. This water may come from rain, sprinkler systems, underground, poor drainage, or floods. When this water evaporates out of the network of veins and through the surface of the paver it leaves behind the white stain known as efflorescence. Long before it ever reaches the surface, the calcium oxide inside of the paver reacts to water in order to produce calcium hydroxide. When calcium carbonate meets the carbon dioxide in the air it reacts by creating a carbonate bloom known as efflorescence. It isn’t until all of the water is evaporated into the air that the white stain shows itself. 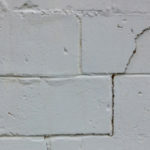 It doesn’t matter how old or new masonry work may be, it is still susceptible to efflorescence. This happens naturally to new and old concrete pavers as well as clay-fired brick, especially where deicers are applied. Are Certain Chemical Deicers More Prone To Cause Efflorescence? The metal ion component of certain deicers intensifies the reaction of water within the brick or concrete paver, setting carbonate blooms free to form on any surfaces the deicers are applied. Certain deicers are more likely to produce efflorescence than others. For instance, calcium chloride and rock salt are some of the worst offenders. On the other hand, magnesium chloride is less likely to produce efflorescence when used on sidewalks, walkways, driveways, etc. If you notice something white growing on the side of your masonry structure you may be wondering: is it efflorescence or is it mold? The two may look alike, but there are countless ways to tell them apart. If you pinch efflorescence between your fingers it turns to powder, while mold does not. Mold grows on organic substances, but efflorescence grows on inorganic building materials. Mold will only grow on inorganic building materials if there is available dirt or foliage to feed on. Efflorescence evaporates when sprayed with water, but mold does not. Mold comes in every color, but efflorescence is almost always white. If you’re the daredevil type you could taste it—although it’s not something we recommend. If you do though, efflorescence is salty. If you only experience efflorescence during the winter months when it snows, you know the source of your issue is the deicer you are using. In this case, your best bet is to find a brand of deicer that cannot effloresce. There are a few products out there that greatly reduce the risk for efflorescence. Avoid deicers most likely to contribute to the problem. 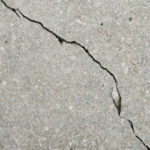 You can also apply a high quality concrete or brick sealant to help reduce the issue. Help… I Keep Washing Off Efflorescence But It Won’t Stop Coming Back! Do un-cleanable brick or concrete pavers currently plague you? Do you clean the white stain off over and over only to see it return? If so, the first step is to identify the source of the stain. If it’s winter and it’s snowing, chances are deicers are to blame. There may be different issues at other times of the year. In fact, poor drainage and sprinkler systems are just two of many other common contributors to out of control efflorescence. Efflorescence is bound to occur when a reactive metal ion interacts with carbon dioxide and forms carbonate, the white patch you can see. The type of paver you have will help determine the best solution. If you have cement paver type the source of the free metal ion causing the carbonate bloom will differ compared to clay fired type. If the cause is related to deicers the impact will be short-lived, disappearing with the end of winter. On the other hand, other causes of efflorescence may persist for many years, and even throughout all four seasons. If this is the case, call Turnbull Masonry out to troubleshoot the issue. 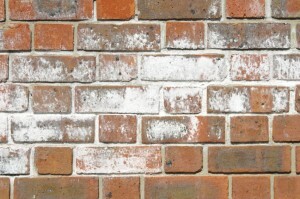 Can Efflorescence Damage Concrete & Brickwork? Need help troubleshooting and preventing the build up of efflorescence? 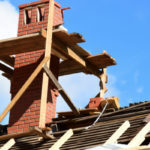 Call Turnbull Masonry today!